Our friend Debra Bellon, a writer and filmmaker who lives in Toulouse, has a two-year-old son and a brand-new baby girl. Debra has been creatively percolating during the past couple of years, as many of us do while we’re otherwise occupied caring for little ones. 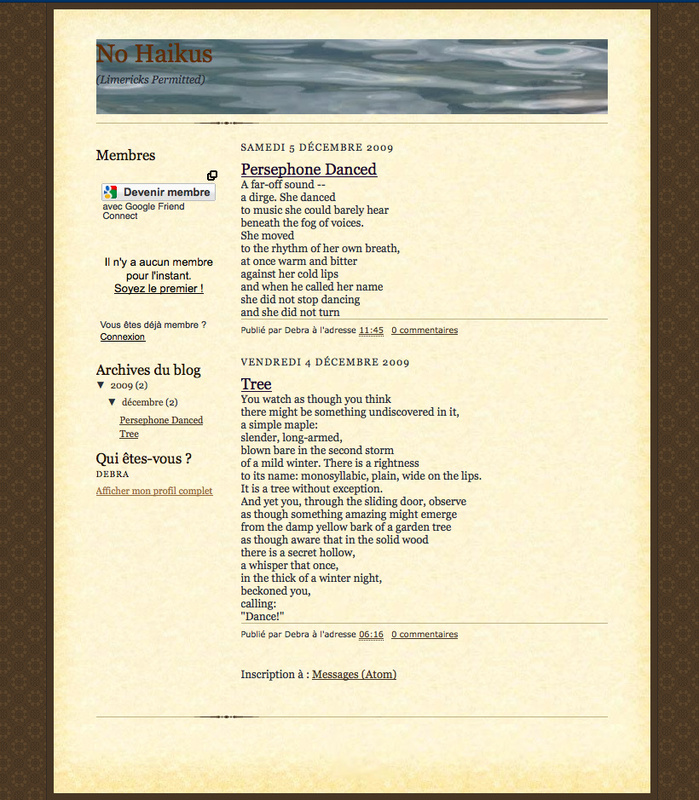 To that end, Debra just launched a new blog site for her poetry: No Haikus. Debra says, “I’m going to see if I can write a poem a day, with each poem using a word from the last, if that makes any sense.” She has asked for support and encouragement from the Studio Mothers community — so please visit Debra’s blog from time to time. You know how having an audience helps to keep us honest and committed! Félicitations, Debra! We much look forward to seeing more of your work. ← The Fixed-Schedule Effect: Secret Keys to Life? What an original idea for a writing blog. I read the poems you’ve posted thus far and absolutely LOVED them! that is a great idea! i will add debra to my blogroll on my blog so i can see her new poems, and maybe they will inspire me as well! Thank you so much for your comments! I already feel more inspired to keep writing!